The magician shows a COPPER COIN and an ONE DOLLAR in the left hand. He closes both hands and when he opens the left only the COPPER COIN can be found because the ONE DOLLAR has appeared in the right hand! The magician shows a ONE DOLLAR and an COPPER COIN and places them in the hand spectator. The magician then asks the spectator to put their hands behind their back and pass a coin without looking. Then he asks the spectator to open the hand with the COPPER COIN and amazingly, there is a COPPER COIN! But the magician opens his hand only to find a quarter! The ONE DOLLAR has vanished!! The magician shows two coins; a COPPER COIN and an ONE DOLLAR, and places them on a pad or tablecloth. He then waves his hand over them for but a second and uncovers them only to find one coin! When he lifts the pad/tablecloth, the ONE DOLLAR is revealed!! Tango Magic produces the highest quality gimmicked coins in the world. Tango stands behind their products to guarantee your success. As a bonus to thank you for your purchase, Tango has included in this packageTangopedia, a four-hour instructional DVD. This DVD includes basic instructions for more than 50 gimmick coin routines using a variety of our specialty coins such as Expanded Shell-Coins, Copper/Silver/Brass, Scotch and Soda, Pen Through Coin, Folding Coins, Okito Boxes, and more. 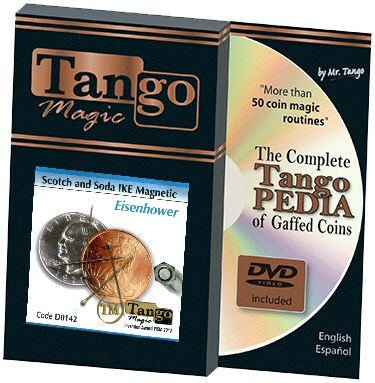 From this DVD you will learn the basics of using your new Tango Magic products as well as gaining insight into the amazing of possibilities the Tango line of coins provides.